PSI Equipment is your local Hotsy dealer for Northwest Arkansas, representing the #1 name in pressure washers. We have been taking care of our customers since 2008 with timely service, competitive prices and fairness. We are here to share our cleaning expertise with you, giving advice when it comes to high-pressure cleaning equipment. Your satisfaction is our ultimate priority. We have the best selection of industrial pressure washers in the state, with hot or cold water models available. 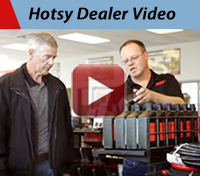 Hotsy offers excellent warranties, are ETL safety certified and come with a reputation for quality. Choosing a Hotsy, means you’ll also be starting a relationship with PSI; we’ll be here to care for your equipment long after the sale. When you need service or parts and accessories, we’ll have what you need at a good price. PSI Equipment is a family-owned business serving Fayetteville, Bentonville, Bella Vista, Springdale, Siloam Springs, Huntsville, Harrison and all points in between. Contact us to see a Hotsy pressure washer demo and you’ll too learn that Nothing Cleans Like a Hotsy!